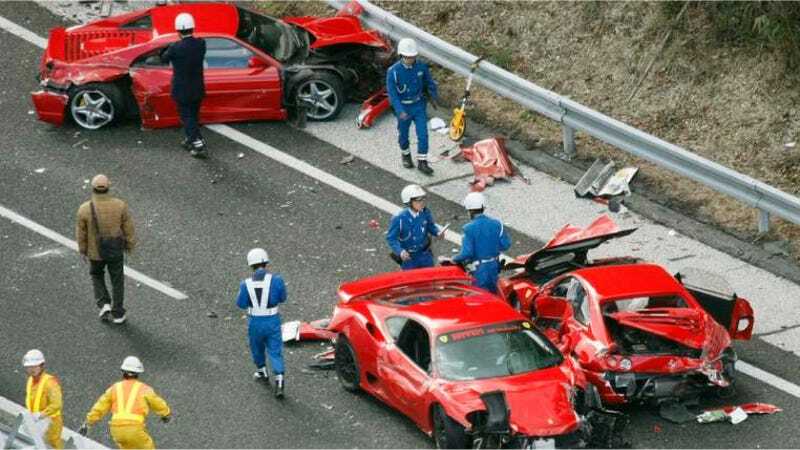 Remember the Japanese car crash from 2011 that destroyed eight Ferraris, three Mercedes-Benzes and a Lamborghini, and was thus dubbed the most expensive car crash of all time? Now, 10 people involved in that $4 million crash are headed to court, and prosecutors may decide to charge them with violating traffic laws. The UK's Telegraph reports that 10 people between the ages of 38 and 61 may face criminal charges. Police sent the case to prosecutors, claiming the drivers were exceeding the speed limit (in those cars? No way!) or not paying attention while they were driving. "It's rare to see a chain-reaction accident like this involving expensive cars," said Tanaka. "Some of the drivers told us they didn't really know the specifications of their cars or just how powerful their acceleration was." Well isn't that just swell. Any thoughts on what should happen to these guys?